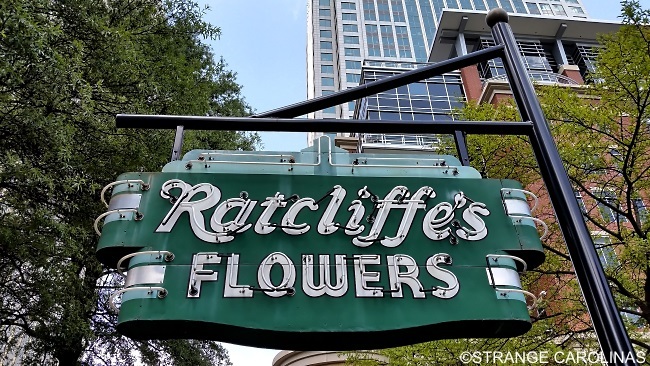 Across the street from Charlotte's Bechtler Museum of Modern Art (home of the infamous Disco Chicken), you'll find a beautiful old neon sign touting Ratcliffe's Flowers. But what you won't find is a flower shop. Or any shop, for that matter. According to the Charlotte Observer, Louis Ratcliffe opened Ratcliffe's Flowers at this location in 1917 and it remained in operation until 1989. In 2000, First Union Bank wanted to build a parking deck close to the building. Faced with either razing the building it or moving it, First Union Bank made the extremely commendable decision to move the 650-ton building one block away. Today, the Ratcliffe's Flowers sign can be found where the building originally stood. One more cool story about the Ratcliffe's Flowers sign: in the 1950s, Tryon Street businesses agreed to remove the neon signs in front of their buildings as they felt it looked a bit tacky. All removed their signs, except for Ratcliffe.